Tracking your business expenses is so important and using the right tools makes it easy. There are a lot of options out there and it can be overwhelming sometimes to choose something that you feel is going to work for and with you and also be a good value. Spreadsheets work for awhile but they become outdated and take more time than they are saving. 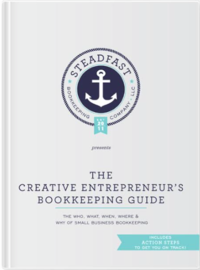 It’s a great method to use in the beginning stages of your business before you really know the importance of good bookkeeping but there comes a time when you must upgrade to the real deal. Wave is another good option. It’s especially recommended if you have an Etsy shop because it has some great integration options with Etsy shops. It will sync your expenses from your bank and allow to categorize as needed. Just like Quickbooks Online, there is also an option to add a pic of your expense receipt directly into the software so you can see with your expense transaction. One of the biggest pieces of advice I can give – Create Electronic copies of your receipts. Receipts fade over time and they can get lost easily. Go ahead and take the time to snap a picture, scan them in or whatever you have to do to get those expense receipts in electronic format. Categorize, save receipt, record and you’re done. Simple, huh? It really is. Once you purchase the item and are ready to record it’s as easy as categorizing it in your accounting software, saving the electronic copy and making sure the transaction has been recorded. « Can I Expense That?